A lot of things can change in forty years or so, as these two photos illustrate. 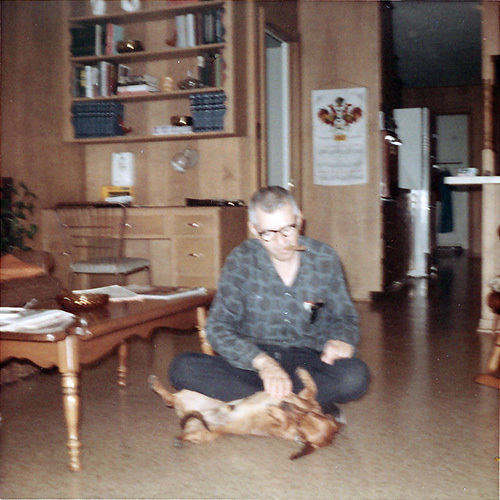 The first one, probably taken around 1965, shows my dad playing with our dachshund in the family room, or “den,” as we called it. 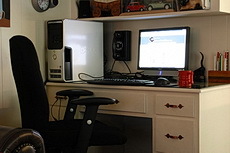 (still do) The second picture was taken a few weeks ago, and is a close-up of the built-in desk shown in the first photo. As seen in the first pic (sorry for the poor focus), our primary phone was a trusty Western Electric 554, a phone that never, never should have been taken out of service. 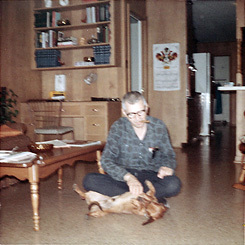 But then again, not much about the room is as it was then, with the linoleum replaced by carpet, the wood paneling painted white, etc. I decided that it only made sense to put a 554 back over the desk, but not another white one, as it wouldn’t show up against the paneling. I thought about a number of colors, but ended up choosing black… a black model 354. The Western Electric model 554 had already replaced the 354 by 1960 when the house was built, so one might say that a 554 would have been the logical choice. But when my friend Dennis Markham told me that he was restoring a black 354, and that he might be interested in a trade for one of my North Electric Galions, I couldn’t resist. The W.E. model 302 was the phone that first attracted me to the hobby, so its wall-phone cousin, the 354, had a natural appeal. The trade was made, and I couldn’t be happier with my decision. The 1952 vintage model 354 seems pretty content too, even in a newfangled 1960 home.